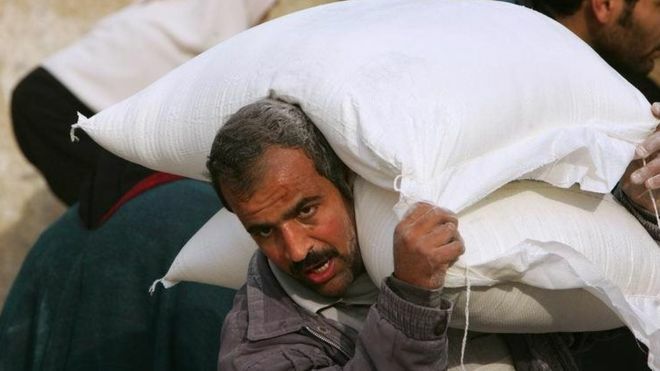 A Palestinian man carries sacks of flour supplied by the UN in Gaza City. 1 Feb 2019 – More than $60m (£46m) in annual funds for the Palestinian security services has now ended, and – while Israel has backed some previous cuts in US aid for Palestinians – officials have expressed concern about this move. This allows Americans to sue those receiving foreign aid from their country in US courts over alleged complicity in “acts of war”. “We do not want to receive any money if it will cause us to appear before the courts,” he said. “We are not seeking anything, the Americans have made their decision, but we will continue to participate in the fight against terrorism in the region,” Mr Erekat went on. “At the request of the Palestinian Authority, we have wound down certain projects and programmes funded with assistance under the authorities specified in ATCA in the West Bank and Gaza,” a US official told the BBC on Friday. “Our work was really important. We’d made a big impact but now we’re stopping a lot of our projects in the middle,” said one Palestinian whose position in law and order supported by USAID was terminated this week. Speaking on Israeli radio on Thursday, security cabinet minister Yuval Steinitz said “we will find a solution”, adding that he could not go into details.